Abundance is a feeling we all desire. Abundance is experienced as a sense of freedom, well-being, desired lifestyle, choices, harmonious relationships, worthiness, clarity of focus, ease, exhilarated curiosity and interest, passion and the list goes on. Many people think that a big fat bank account will bring them abundance. I want to say that abundance lies within you. It is an inner experience that you can create. A shift in perspective will lead to feelings of abundance. Take a look at your core beliefs. Remember that beliefs are just a composite of thoughts you think habitually. Know that you have the personal power to always reach for a better feeling thought and bring into your reality a more blissful state of mind, greater physical vitality, and forgiveness into our hearts to support our relationships. It is a choice we can make every day. 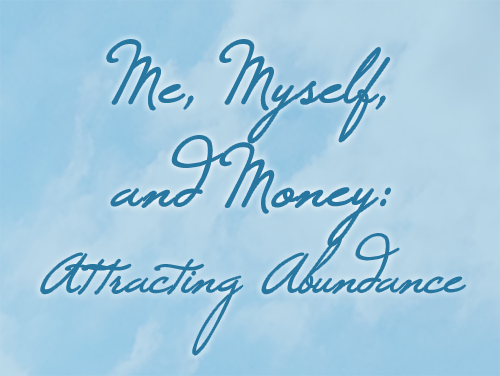 Many people think that abundance is synonymous with money but it is not. Money is simply an exchange of energy. Back in the day, we used to operate on the barter system so you could see the physical exchange of items and know what effort people put into the creation of the item. Money, a third party tool, is used to show our value for something, how much energy we want to put towards something or withhold from something. When we focus on abundance in our lives, we experience more abundance. Abundance begets abundance. Think about all of your blessings. Think about all of the things, people and experiences you enjoy and watch how they expand. It is truly the law of attraction. Money is something that will flow towards you when feel really good about it, when you know intuitively that you deserve it and you are playful about it. You deserve it!!!! So take a moment and look at your personal lifestyle goals. The movement is towards Freedom. Here is a new way to think about your choices for the life you desire by deliberate design. It is a very old paradigm but being used more readily now. Are your choices coming from a conditioned place or an unconditioned place? Conditioned are all the things you see around you. All the things you are taught and deemed to be “proper”, “correct”, and “sensible”. Conditioned things are learned ideas, thoughts, behaviors and the justification for subsequent emotions. Conditioning occurs as you grow from childhood by your families, your teachers, your colleagues, your friends and the like. For example: Most middle class people live with the idea that in order to be successful in life, you need to go to school, then college then get a good paying job. The life will be ok and you will be safe. That is a societal norm. The unconditioned place resides deep inside of each and every one of us. Nobody is exempt from this treasure chest. It is your essence. It is your all knowing place that intuitively knows what the next right move is. Do you listen to it? When you do, does it expand? Of course it does. Anything you give your attention to will expand. Do you operate from that place as a parent, as a friend as a child, as a sibling as a professional? Do you have a conversation with that place inside of you? If that voice told you to take a day off from work, would you do it? Or would you dismiss it as ridiculous? The face of the planet is changing. People are accessing this unconditioned place more and more and its source is the right brain. The right brain is your link to your imagination, your ideas, your creativity, your inspiration, your all knowingness, your bliss, your joy, and most of all your freedom. The left brain is your conditioned source and very much a resource for implementation. HOWEVER, are you taking direction from your left brain which is more linear and has more to do with sequencing, logic, calculations, judgment, criticism, categorizing, analyzing OR are you taking your input from your unconditioned place, your right brain, and allowing the energy of holistic thinking, clarity, subjectivity and inspiration guide you in your endeavors? Imagining a reality through your mind’s eye with a strong visual and sensate component is the place to access worlds by deliberate design. There is a metamorphosis that is occurring and the momentum is picking up for an expansion of this energetic shift. It is a shift in perspective. This entry was posted in Blog on January 15, 2015 by darrynsilver.